Pundemonium! 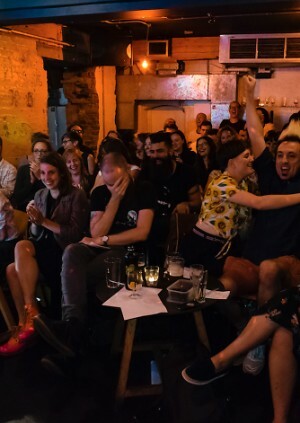 returns in May for the second of just three special shows at The Book Club for 2019, with tenuous thematic inspiration from bank holidays, Labour Day and, er... tired Theresa. Running since 2016, Pundemonium! LIVE is a cult comedy game show full of PUNishing linguistic challenges for compulsive punners and their carers. Guest pundits including comedians, poets and writers compete alongside members of the public for the coveted ‘Thesaurus Rex’ trophy. Got appundecitis and want to give it a go? Email: pundemoniumlive@gmail.com in advance to sign up. Pundemonium! is conceived and produced by Daniel Pitt and Rachel Mars. Be PUNctual for an 8pm start. Advance booking highly recommended – we regularly sell out! Follow @PundemoniumLIVE on Twitter or Facebook for updates.